Well wishes for the people of Houston and Southeast Texas. Harvey hit harder than expected, but we will overcome as we always do. If you would like to help out, text 90999 to make a $10 donation to the Red Cross to help relief efforts. Here are the Rumblings. With a couple days left before the trading deadline, the Oklahoma City Thunder sit with the third best record in the NBA, and are 1 of 3 teams with at least 40 wins at the All-Star break. That would usually be great for most years. But this season, the two teams with better records than the Thunder are 1) in the same conference and 2) on historic win paces. Any move the Thunder make during the trade deadline will be with these two teams in mind. As currently constructed, the Thunder are better equipped to deal with the San Antonio Spurs than the Golden State Warriors. They match up well position for position, and have the athleticism to give the Spurs problems. The Warriors on the other hand, present a different set of problems for the Thunder. Their penchant for scoring from the outside has baffled every team in the league. The Thunder have a habit of letting teams beat them from the outside, but for some reason, they have defended the Warriors reasonably well over the past two seasons. When it comes to trades, its always about what a team needs and what a team is willing to offer. The Thunder were extremely busy before and during the trade deadline last season, acquiring Dion Waiters, Enes Kanter, Steve Novak, DJ Augustin, and Kyle Singler. All five players are still on the roster this season, with Kanter and Singler signing multiyear extensions in the offseason. In addition to the players the Thunder gave up to acquire that quintet, they also gave up two first round picks in the process. Those first rounders are lottery protected and likely will be honored within the next three years if the Thunder can keep their core together. With all that said, here’s a look at a couple of the assets the Thunder have in tow. Trading Ibaka this season is highly unlikely. He’s the third cog in the Thunder’s Big 3 and has been there from the beginning of the run. But while Kevin Durant and Russell Westbrook have expanded their games to become two of the best players in the league, Ibaka, for all his tools, has never been able to consistently put it all together. Be it the low basketball IQ or the fact that Ibaka may not be as young as his counterparts, the time for Ibaka on the Thunder may be numbered. While he hasn’t necessarily been injury-prone throughout his career, he does appear to be slowing down. His rebound and block numbers are the lowest they’ve been since his rookie season. His overall FG% is under 50% for the 2nd straight season, after starting off his first 5 seasons above the median line. In addition, three factors are working against Ibaka remaining in the current position he is in after this season. 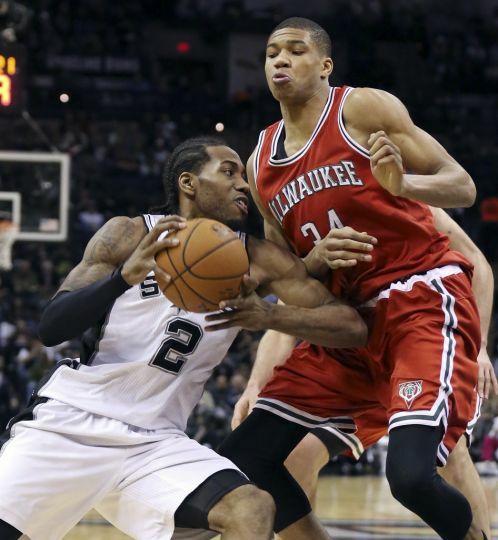 First, the style of play in the current NBA has negated the need for a shot blocker. Remember when the Lakers, Celtics, Magic, and Spurs were the class of the NBA in the late 2000’s and early 2010’s? It was all because of the big man position. Andrew Bynum, Pau Gasol, Dwight Howard, Kevin Garnett, and Tim Duncan were all extremely influential in their teams’ runs to the Finals during that period in time. The Thunder, trying to get to that position of power, decided to trade Jeff Green and Nenad Krstic to the Celtics for Kendrick Perkins. Not only did the trade give the Thunder a defensive post player, but it also opened the door for Ibaka to become the premier shot-blocker in the league. Well, those days are gone. The pace and space NBA has basically eliminated the need for a premier post defender. Elite wing defenders are where the money is now. Secondly, in keeping with the fact that the NBA is changing, so too have positions changed. The traditional view of power forwards and centers no longer works in this new NBA. In its stead, successful teams are now starting to trot out bigger small forwards to play the power forward position. What a team may lose on the block, it may gain on the offensive end with more 3’s and transition buckets. Kevin Durant began his career as an oversized two guard, but eventually settled into his more natural position of small forward when Scott Brooks became the Thunder’s head coach. Through the years, the natural progression of an athlete’s body has allowed Durant to get a little bit thicker as he has aged. That increase in weight has allowed Durant to not only play in the post more as an offensive player, but also to better defend post players on the other end of the floor. Shifting Durant to PF permanently wouldn’t be that big of a jump for the Thunder. He’s already leading the team in rebounding and is second on the team in blocks per game at 1.2. Thirdly, Steven Adams has become the prototypical post player for this new NBA. Someone who is athletic enough to patrol the entire paint, but also strong enough to play the enforcer role. He’s younger and more mobile than Ibaka, and he comes at a much cheaper price, for now. That’s where the decision will come into play after this season. Adams still has one more year left on his rookie deal after this season, but the Thunder have first dibs on an extension after this season. Adams will likely command a salary upwards of $12 million. Ibaka comes up for free agency the same year Westbrook does. If the Thunder are able to keep both Durant and Westbrook, they’ll be no way they can also keep Ibaka and Adams. Again, I’m not saying it’ll happen this season. But Ibaka’s $12.25 million dollar salary may be useful if a jackpot deal pops up. And if that deals becomes availalbe, the team may think long and hard about trading Air Congo. 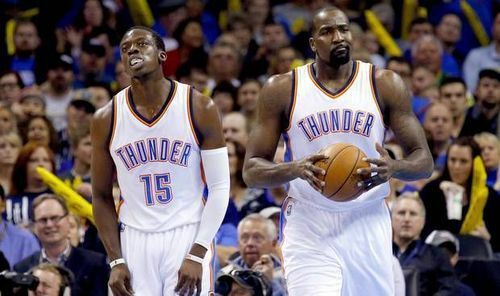 The Thunder have a couple expiring contracts that may come into play during the trade deadline. DJ Augustin and Steve Novak are both on the final year of their deals, while Dion Waiters is on the final guaranteed year of his rookie contract. If Waiters is traded, the team he is traded to will have the right to match any offer Waiters is given in the offseason. But Waiters plays a big role on the Thunder as a multifaceted guard and will likely remain in that role throughout the season. The Thunder are in a bit of a precarious situation with Augustin. His $3 million dollar salary may be useful in a trade, but the Thunder have to make sure they get a veteran point guard either via trade or as a buy-out signee. If the Thunder trade Augustin without getting another another veteran point guard, they risk heading into the postseason with rookie Cameron Payne as their only other option behind Russell Westbrook. While Payne has been good, the Warriors’ game showed that the postseason lights could a little too bright at this moment for the first year player out of little Murray State. 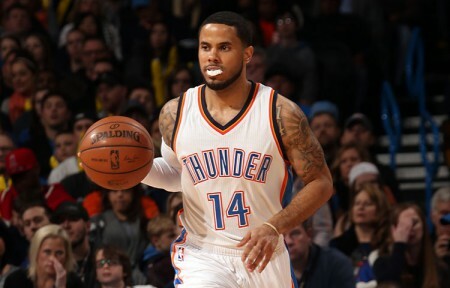 The Thunder may just keep Augustin around as the veteran third string point guard. Novak, on the other hand, is almost guaranteed to be moved by the deadline. His $3.75 million dollar contract is big enough to fetch a player of value for the Thunder. But also, the Thunder may just trade him to a team that needs salary in order to have an empty roster spot for a buy-out candidate, such as Joe Johnson or Kevin Martin. The second year big man showed a lot of promise in the offseason and preseason. But a concussion in the preseason kept him out of the final week of practice heading into the season opener, and he has yet to find his footing in the rotation this season. 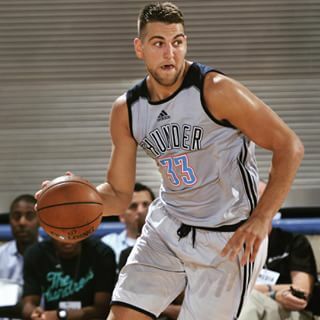 McGary may be the Thunder’s most attractive asset as a young big on a cheap rookie scale contract. But that may also be the reason the Thunder keep him. This year, the Thunder have their own 2nd rounder and, likely, Charlotte’s 2nd rounder, which is protected for picks 56-60. In addition, the Thunder still have their 2nd round pick for 2017 and Memphis’ 2nd rounder for that year also (protected 31-35, unprotected in 2018). Second round picks are good filler for trades involving players that bring little to nothing to the table. For example, if the Thunder trade Steve Novak to the Trailblazers as a salary dump, then attaching a 2nd round pick will probably make it worth the Blazer’s while to take on Novak’s salary for the last 2 months of the season. In addition to the 2nd round picks, the Thunder also have two trade exceptions. The Jeremy Lamb trade exception is worth $2.13 million and the Luke Ridnour trade exception is worth $2.85 million. While those amounts are relatively small, if a team is looking to unload one of their younger players without taking on salary, a trade exception may be the way to go. The Thunder own the rights to the 22 year old Spanish guard who is currently averaging 8 points per game on 41% shooting from 3-point territory for one of the premier teams in Europe, FC Barcelona. He is signed through 2019, but has a buyout clause. He lacks the athleticism to be a regular rotation player in the NBA, but would be a good addition as a 3-point specialist (a la Anthony Morrow) for a team that may need perimeter scoring in the future. For as good as the Thunder have been this season, they still have holes that can be filled to further contend with the top teams in the league. Here’s a look at some of the areas of the need the Thunder could possibly fill. In this new NBA, the premier role player is that of a 3 and D wing. 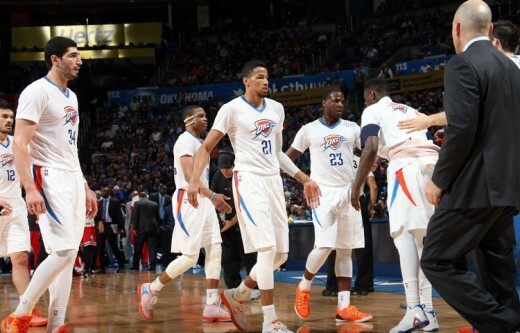 The Thunder have about 4 players in their rotation that masquerade as 3-and-D wings. The only problem is that those that are good at 3-point shooting (Anthony Morrow) struggle on defense, and those that excel at defense (Andre Roberson and Kyle Singler) struggle at consistently hitting their perimeter shots. The only player on the roster that qualifies as a viable 3-and-D wing is Dion Waiters, and he is great at neither. Keeping up with the Warriors and Spurs of the league necessitates a team to have players that can be effective on both ends of the floor. The two players most commonly associated with the Thunder for this position are PJ Tucker of the Phoenix Suns and Courtney Lee of the Memphis Grizzlies. Both players are in the $5.5 million dollar range and could be had for an expiring and either McGary or Josh Huestis. Some other surprising candidates may be Mirza Teletovic of the Phoenix Suns ($5.5 million) and Ben McLemore ($3.16 million) of the Sacramento Kings. Thunder GM Sam Presti has a habit of running misdirection plays where everyone in the media thinks he’s going one way, but he ends up going an entirely different direction (think last year with the Brook Lopez/Enes Kanter trade deadline happenings). While Teletovic is a bit too big to be a wing, he does bring the “3” part of the equation with him. He would allow the Thunder to stay big, while going small (Teletovic at 3, KD at 4, and Serge/Adams/Kanter at 5). McLemore would fall in line as a Presti reclamation project. The third year guard has never lived up to his No. 7 draft selection and has seemingly fallen out of favor in Sacramento. He came into the league as a player that could possibly be a good 3-and-D wing. Unfortunately, he has been inconsistent on both ends of the floor. McLemore could be a good replacement for Waiters if he bolts for greener pastures in the offseason. 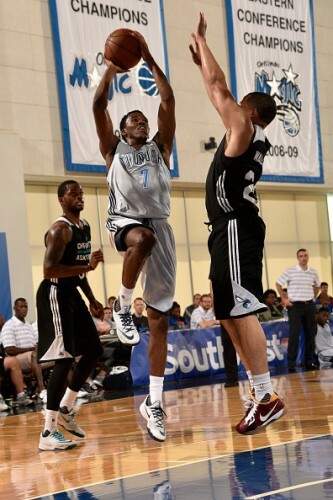 Another name to watch out for is Victor Oladipo of the Orlando Magic. This one would probably require Serge Ibaka to move the needle enough for Orlando to make that trade. This one is likely not to occur this season. If the Thunder plan to use DJ Augustin’s expiring contract in any of their trades, they would also need to obtain a veteran back-up point guard to buffer any of the inexperience Cam Payne would bring to the playoffs. A couple options are Michael Carter-Williams of the Milwaukee Bucks and Darren Collison of the Sacramento Kings. Carter-Williams is a big point guard that is a triple-double threat every time he steps on the floor. But his inconsistent jumper and being turnover prone continue to affect his play on the court. In addition, there are rumors that MCW isn’t really the easiest guy to get along with in the locker room. These are probably all reasons why the former Rookie of the Year could possibly end up on his third team in three years. Darren Collison has been one of the best back-up point guards in the league. If Sacramento is indeed having a fire sale and looking to build for next season, then Collison may be one of the players that could be had from them. Unfortunately for the Thunder, he has another year left on his contract after this one. The Thunder really like Payne and getting Collison could stunt his development into next season. The Thunder may eschew taking on another player in favor of just trading one or both of their expiring contracts in a salary dump to open up roster spots. Empty roster spots can be very valuable during this time of year. The buy-out market begins once the trading deadline has passed. Players like Joe Johnson, Kevin Martin, and Andrea Bargnani are a few of the names mentioned that will likely be bought out after the trade deadline. While none of those players would likely be a regular rotation player for the Thunder, they could be great in a specialist role off the bench. In addition, the Thunder have a couple players on their D-League team that could have some value to the Thunder. JP Tokoto has been good as a wing for the Blue, averaging 12.4 points, 4.8 rebounds, and 2.2 assists per game. Tomislav Zubcic, who was a late addition to the Blue roster from his native Croatia, has been averaging 8 points on 42.6% shooting from deep this season. In addition, the Thunder currently sit about $12.4 million dollars over the luxury tax line. It’s a given they will pay the tax for a second straight season. But being that much over would mean the Thunder would have to pay out about $22 million. If they can lower their bill, it would be that much less the Thunder has to pay out to the rest of the teams that aren’t over the luxury tax. While the Thunder don’t seem to have the assets to do something big, if they feel this is the right time to pull the trigger on something, they may do it. Durant’s upcoming free agency and the fact that the Thunder are in the thick of things as far as contention goes, may sway them to do something outside the ordinary. As is the case usually with the trade deadline, all everyone is waiting for is for the first domino to fall. A long-standing national nightmare is finally over. The hostage situation in Oklahoma City that engulfed most of the basketball world for the past year has thankfully reached its conclusion. The Oklahoma City Thunder on Thursday (finally) signed last season’s first round pick, Josh Huestis, to a four-year rookie scale contract. What’s that? You don’t know who Josh Huestis is? You never realized there was a hostage situation brewing for the past year in Oklahoma City? Ooooh, you thought the only recent hostage situation involving an NBA player was in Houston in early July, when the Los Angeles Clippers (yes, the entire team) sequestered DeAndre Jordan in his home and forced him to sign a near-max contract to return back to LA. Well, I guess you aren’t a true NBA fanatic, then. Rewind back to last year’s draft. The Thunder owned the 21st and 29th picks in the draft. At 21, they selected Mitch McGary. While that pick was viewed as a bit of a stretch due to McGary’s injury history and previous suspension in college due to marijuana usage, the talent was definitely there to help explain the pick. 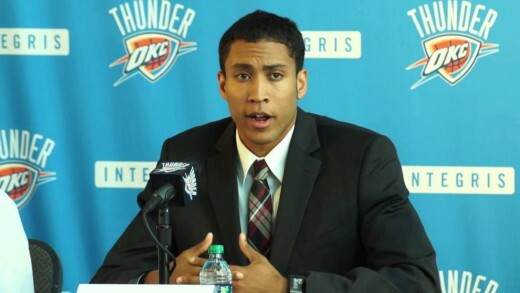 With the 29th pick, the Thunder selected Josh Huestis from the University of Stanford. Collectively, much of the NBA wondered, “Who?”. Draft Express didn’t even have a “strength/weaknesses” pre-draft video on Huestis. Here was a guy that was slotted to go in the middle to bottom half of the 2nd round or to go undrafted, and instead, he was selected by the Thunder in the next to last pick of the first round. Huestis went on to play with the Thunder’s D-League affiliate for the entire season and ended up earning about $25,000 for his one season with the Blue. He averaged 10.2 points, 5.6 rebounds, 1.1 assists, and 1.5 blocks per game on 31.6% shooting from 3-point territory. That last stat is an important because the Thunder need role players that are able to play on both ends of the floor. The one skill Huestis was known for was his defense. It’s his development on the other end of the floor as a 3-point shooter that the Thunder want to enhance. While Huestis’ time on the Blue wasn’t memorable, he did develop into a role similar to what he will play on the Thunder. The fear from many writers was that the Thunder made this deal from a position of power and would exploit, not only Huestis, but also NBA salary cap and draft rules from that position. In the worst case scenario, the Thunder never offer Huestis the contract that he deserves as a first rounder, which in turn, would help the Thunder stay under the luxury tax or pay less money if they were over the tax. In essence, the Thunder would circumvent having to pay a first rounder, while paying less (or no) money towards the punitive luxury tax. From a cutthroat business perspective, it would’ve been a win/win for the Thunder. The team stays away from paying money to a player while also preventing or lessening the amount they have to pay to the NBA. But the NBA, while being cutthroat as a business, is also very good at remembering a front office’s transgression, especially players and their agents. As a small market team, it would behoove the Thunder to not burn too many bridges throughout the NBA. Which is why the supposed “nuclear option” was never at play for the Thunder. Renege on this hand-shake agreement, and agents would be very leery to even suggest Oklahoma City as a destination to their player clients. Huestis and the Thunder were always in lockstep in this deal, and the writing was clearly on the wall when the Thunder traded Perry Jones to the Boston Celtics in early July. The Huestis deal is a basic 4-year rookie contract where the first two seasons are guaranteed and the last two are team options. Since Huestis signed the contract this season, he gets locked into this season’s rookie salary scale, which will pay him $950,200, instead of the $918,000 he would’ve earned last season. Huestis will likely see a lot of his playing time this season at the Cox Convention Center, playing for the Blue. 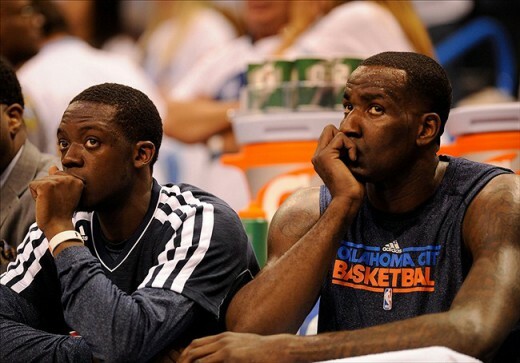 With a deep and talented, there will likely be no minutes for Huestis on the Thunder this upcoming season. Huestis comes into this season rehabbing a torn pectoral muscle he suffered earlier in the summer, and will likely start the season on the injured list. With this signing, the Thunder sit at 15 guaranteed contracts. The Oklahoma City Thunder showed what a team with a little bit of chemistry can get accomplished in their last game against the Orlando Magic Blue team. This Thunder team, which is mostly comprised of players from the Thunder’s Developmental League affiliate, the Blue, have something a lot of teams in summer league do not have: familiarity. Whether its Semaj Christon knowing exactly what sets to run, Frank Gaines setting up in optimal spots to get wide open shots, or Talib Zanna and Richard Solomon knowing when to roll or where to rebound, its a team that knows itself. And that becomes very evident in the first couple games of summer league. The Thunder find themselves sitting at 2-0, behind the Miami Heat and the Orlando Magic White team, who are also undefeated, but have either won more quarters than the Thunder or have won by a larger margin. There comes a point in summer league, where the players who are bonafide NBA players, rise to the top of the heap. That’s what happened in the last game as Mitch McGary and Aaron Gordon put on a show. Gordon finished with 21 points and 10 rebounds on 8-11 shooting, while showing a vast array of ball-handling skills and play-making ability. McGary on the other hand, finished with 19 points on 9-12 shooting, and showed a Magic Johnson-like ability to grab a rebound on one end of the court and start a one-man fast break towards the other end of the court, usually ending with a transition basket. The Los Angeles Clippers summer league team is currently 0-2, one of four teams in the Orlando Summer League to yet win a game. The team is comprised of several players who have NBA experience, but the chemistry appears to be lacking. The strength of the team lies in its backcourt duo of Nate Wolters and CJ Wilcox. Wolters has been in the league two years and is looking to latch onto to a team for this upcoming season. Wilcox, the Clippers’ first round selection from last season, played in only 21 games and is looking to expand his role on the team with the departure of Matt Barnes and Spencer Hawes. Another player looking to get picked up by a team for this upcoming season is Jordan Hamilton, who has four years of experience in the NBA. Hamilton is a versatile power forward who has played with Denver, Houston, and Los Angeles (Clippers) in his short career. Diante Garrett comes off the bench for this team and can be a spark plug 6th man. Royce White, who was last with the Sacramento Kings, is looking to get back in the league after issues with various front offices over his mental health caused him to get waived. Second round pick Branden Dawson is looking to see some action this season in the NBA and has shown a knack for rebounding and defense. 1. 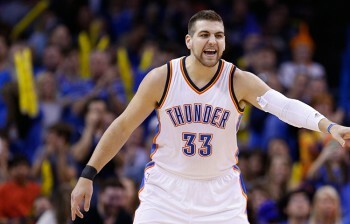 Power forward match-up – Mitch McGary will have another tough match-up on his hands today going up against Jordan Hamilton. While not as versatile as Aaron Gordon, Hamilton is more of a post player, but can step out for the occasional 3-pointer. With the word out on McGary’s transition ability, look for the Clippers to get back on defense as soon as a shot goes up. McGary will likely further showcase his perimeter game today. 2. Attack the defense – Los Angeles has proven they can score in their two games, but they’ve also shown to be a bad defensive team, giving up 75 and 77 points, respectively. None of their players are known as defensive stalwarts and with Semaj Christon’s ability to get past the first line of defense and into the teeth of the defense, it could spell trouble for the Clippers. 3. Rebounding – Rebounding has been an issue for the Clippers this summer. Their only good rebounder is Branden Dawson, who has grabbed 19 boards total in the Clippers’ first two games. Look for Dakari Johnson and Talib Zanna to have double digit rebounding games today. 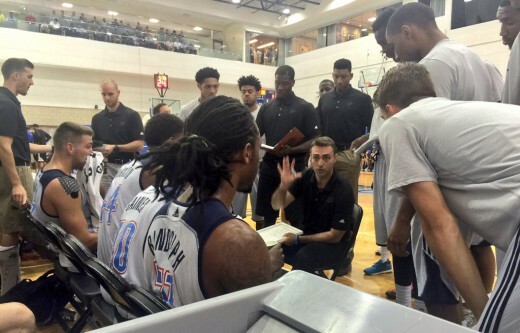 The Oklahoma City Thunder remained unbeaten in summer league play as they defeated the Orlando Magic Blue Team, 73-65. 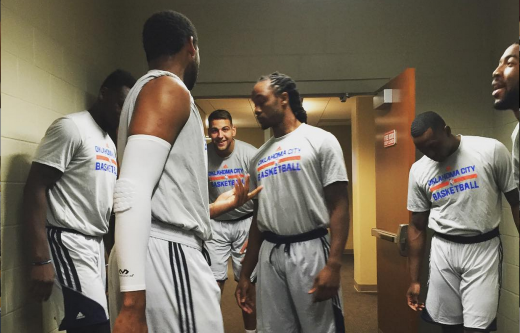 The Thunder moved to 2-0, behind the combined efforts of Mitch McGary and Semaj Christon. The Magic got off to a quick start, jumping out to a 6-1 lead to begin the game. The Thunder weathered the initial storm and stayed in attack mode for the rest of the game. With the score 52-51 in favor of OKC with 8 minutes left in the game, the Thunder started to attack the basket at will and outscored the Magic 21-13 in those final 8 minutes. 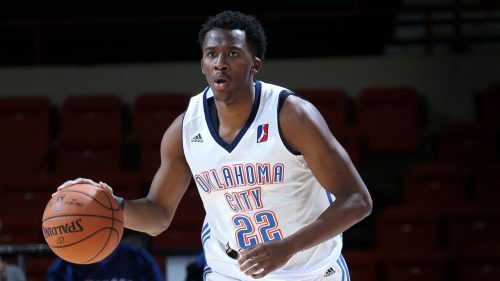 The Thunder featured three players that were constantly attacking the paint (McGary, Christon, and Levi Randolph). For the Magic, only Aaron Gordon and Mario Hezonja seemed to be trying out there. Christon thoroughly outplayed Elfrid Payton, who finished fourth in the NBA Rookie of the Year vote last season. Christon consistently got past Payton to get into the teeth of the Magic defense where he displayed his playmaking ability and an array of tear drops and bank shots. McGary put on a show, going from rebounding the ball on one end of the court to starting a one man fastbreak to the other side of the court. This has always been a part of McGary’s game, and now he appears to be more comfortable in incorporating this into his repertoire more often. McGary also displayed a mid-range jumper, making shots that stretched out past 18 feet. If McGary is able to incorporate that into his game with the Thunder, they may have their hands on another versatile offensive player. For the Magic, Aaron Gordon put on a summer league clinic. He had a double/double, scoring 21 points and grabbing 10 boards. He displayed a versatile offensive game that featured mid-range jumpers, ball-handling, and play-making. Gordon seemed comfortable handling the ball and being the focal point on offense. For Mario Hezonja, this game was likely a microcosm of what his rookie season will be like. There were flashes of brilliance, like the monstrous dunk in the first half and the ‘in your face’ 3-pointer in the 3rd quarter to bring the Magic within 1. But there were also mistakes and inefficiencies that will be a part of Hezonja’s rookie campaign. Hezonja’s finished with 14 points, but on 6-16 shooting from the field (2-9 from the 3-point line). One of his best comparisons coming in was JR Smith, and this performance was very Smith-esque. Elfrid Payton, on the other hand, had a game to forget. He scored just 4 points on 1-3 shooting, while notching 4 assists and 4 turnovers. His shot, which was his biggest weakness coming into last season, seems to have shown no improvement at all. This may be something to watch with his young Orlando team in the next 2 to 3 seasons. The Thunder will play the Los Angeles Clippers on Tuesday, while the Orlando Magic Blue team will play the Memphis Grizzlies. 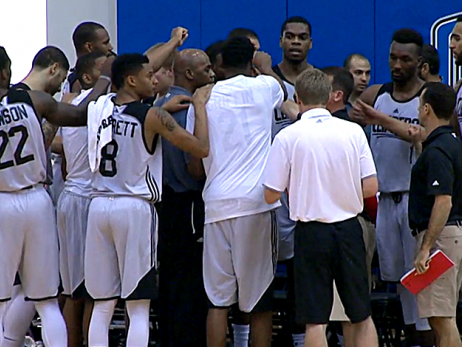 Summer league games are, in essence, exercises in hope. If you’ve watched summer league long enough, you know 80-90% of the guys on the court won’t ever make it to the NBA. If your name was not called in the first round, your chances of making it to the bigs drop significantly. With all that said, though, we still watch. If you are a true fan, you become familiar with all the players on the roster and even start to pick up little tidbits about them. A week later, unfortunately, all that knowledge gets cycled into the memory dump of our brains, and most of those players become but a distant memory. But as you watch the games, you start to notice things about players that may actually help your NBA roster. After one game, the Oklahoma City Thunder sit at 1-0, having defeated the Charlotte Hornets 76-74. 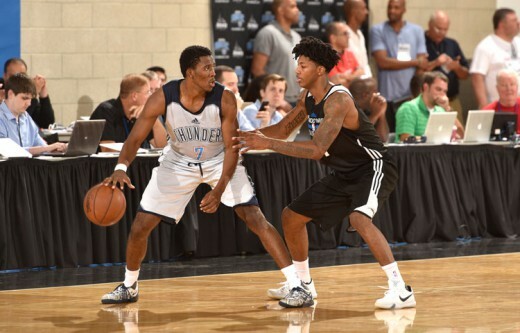 Lacking a dearth of NBA experience, the Thunder summer league roster depended on defense for key stretches in the game and on their back-court duo of Semaj Christon and Frank Gaines, who combined for 31 points. Christon notched a double-double with 14 points and 10 assists, while also hitting the deciding basket on a drive on the Thunder’s final possession. Mitch McGary and Dakari Johnson cleaned up well around the basket, each grabbing double digit rebound totals (24 rebounds total between the two). The spark off the bench came from Travis Bader who came into the game in the 2nd quarter, and quickly racked up 10 points on 2 3-point shots, a mid-range jumper, and 2 free throws. Defensively, McGary struggled a bit with Hornets’ rookie Frank Kaminsky, losing him several times on the pick and roll. Kaminsky finished with 19 points and 12 rebounds to lead the Hornets, but did not score in the 4th quarter. Orlando brings two teams into their summer league. Their White team is made up mostly of guys that will likely spend most of their time next season in the Developmental League and overseas. The Blue team on the other hand, is made up of all the first and second year players that will likely see significant minutes in the NBA this season. This is an extremely smart move by the Magic who would like to see their young guys play together to develop a rhythm, instead of having them mixed with players who, honestly, likely will never sniff an NBA court. The Blue team won its first game against the Los Angeles Clippers, 75-74, in overtime. The Blue team is led by point guard Elfrid Payton, who was first team All-Rookie last season. Joining him on the wing are Magic first round pick Mario Hezonja and second year player Devyn Marble. 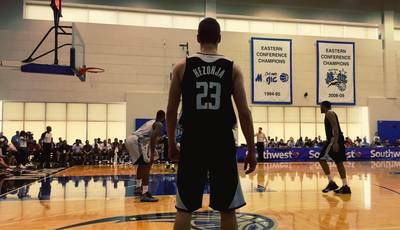 Hezonja hit the deciding 3-point shot in overtime in the Blue team’s first summer league game. Up front, Aaron Gordon and Brandon Davies all have NBA experience. 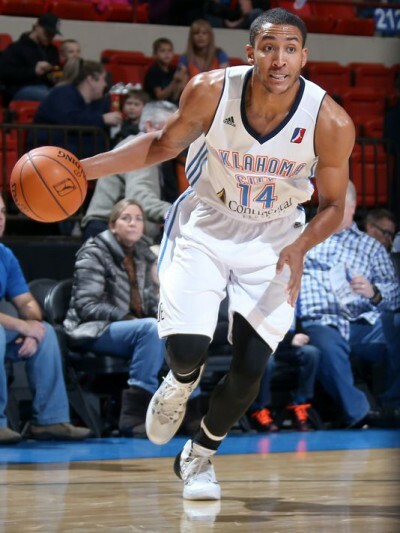 Off the bench, the Magic (Blue team) will likely use their 2nd round pick Tyler Harvey as an offensive spark plug. 1. Experience – The bulk of the minutes doled out to players on the Magic team will be to those players with NBA experience. While the Thunder don’t have the same amount of NBA experience, they do have a team that is quite familiar with itself as most of the Thunder’s roster is composed of players who were on the Thunder development team, the Blue. 2. Summer league superstar match-ups – While there aren’t necessarily any superstars in summer league, there are some interesting match-ups in this game. Aaron Gordon and Mitch McGary will likely match up a lot in this game. Both are athletic forwards that have a year’s worth of NBA experience under their belt. The other interesting match-up will be Elfrid Payton against Semaj Christon. The Thunder love Christon’s game and this will be a good barometer as to how ready he is to play in the NBA. 3. Mario Hezonja – Aside from the Thunder players, I’m most excited to see Super Mario. He was okay in his first game, but when the spotlight shined the brightest in the closing seconds of overtime, he hit the dagger three. This guy is far from a finished product, but his confidence and swagger make him a must-watch in summer league action. The Oklahoma City Thunder head into the All-Star break having achieved what likely has been their first, and most significant, goal in this turbulent season. Build some momentum and some chemistry and stay within striking distance of the 8th seed. In their last 5 games, the Thunder are an Anthony Davis 30-feet heave away from likely being 5-0. Phoenix has sputtered a bit in the past month, and the Thunder find themselves only 1 game back of the Suns. All three teams battling for the 8th spot (Phoenix, New Orleans, and Oklahoma City) come into Wednesday’s action with 25 losses each. Kevin Durant and Russell Westbrook are doing what they have done for the past 6 seasons, which is carry the brunt of the Thunder’s offensive load. Reggie Jackson seems to have remembered how to play basketball in the past week and a half. 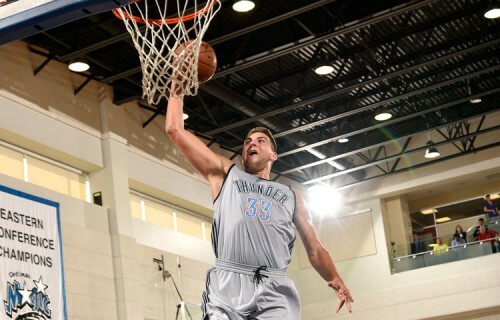 And the Thunder rookie Mitch McGary, having finally gotten over the myriad of injuries that have plagued his inaugural season, has been a breath of fresh air in the past two games, getting a double-double in both games. This is the third of four meetings between these two bitter rivals. The Grizzlies have won the first two games of the season series. In the first game, the Thunder, who were without Westbrook and Durant, battled valiantly against the Grizzlies, but came up short as Serge’s Ibaka’s 3-point attempt at the buzzer just missed. In the second meeting of the season, Durant attempted to come back from a toe injury, but looked out of sorts the entire game. 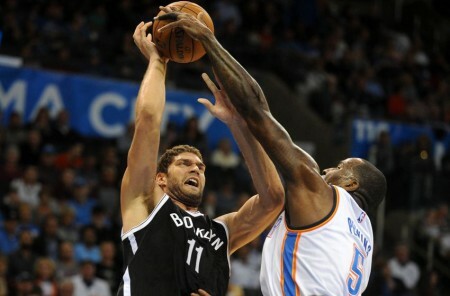 The Thunder were likely pressing, having just lost to the New York Knicks in their previous game, and came out tight. They eventually lost the game 85-74. These two teams have previously met in the playoffs in 3 of the last 5 seasons, with two of those series going to a decisive 7th game. 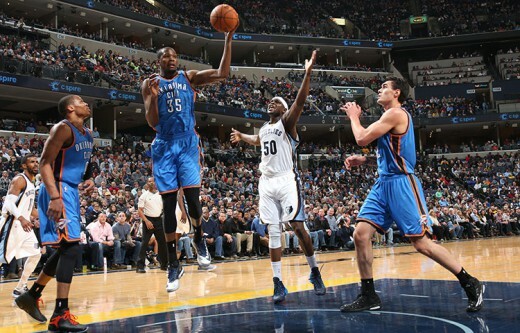 The Grizzlies come into the game with a 39-13 record, good for 2nd in the Western Conference. They’ve won 14 of their last 16 games and seem to be over some of the early season injuries that have plagued them (Mike Conley’s ankles and Zach Randolph’s knee). During this stretch, they’ve also had to assimilate a new rotation player in Jeff Green. The Grizzlies sport one of the best defenses in the league, as they allow only 95.6 points per game (No. 1 in that category) and are the 5th best in terms of defensive rating. They do a good job of defending, without fouling, allowing only 20.5 free throw attempts per game, good for 3rd in the league. The Grizzlies are led by Conley, one of the most underrated floor generals in the league, who is averaging 17 points and 5.4 assists per game. On the wings, Courtney Lee and Jeff Green provide a good contrast in style, with Lee being the perimeter threat (45.8% from 3-point territory) and Green being the jack-of-all-trades. Up front, Zach Randolph and Marc Gasol are arguably the best big man duo in the league. Between them, they average 35.3 points and 20.1 rebounds per game. 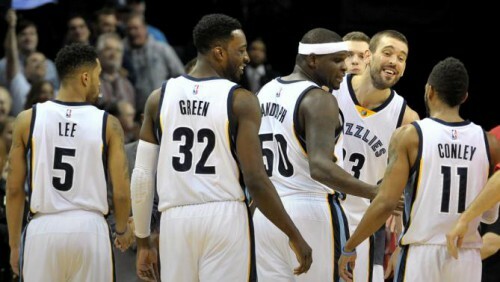 The Grizzlies feature a veteran bench that won’t lose them any games. Their top reserves are Tony Allen, Kosta Koufos, and Beno Udrih. 1. Pace – The Grizzlies love to slow it down and play half court offense. They do a great job of playing inside/out with the two big men and with Conley’s ability to get into the lane. If the game is in the high 80’s to low 90’s, that pace favors the Grizzlies. But if the Thunder can get out in transition and push the pace efficiently on their end, then a higher scoring game will definitely be in the Thunder’s favor. Plus, the Grizzlies are on the second game of a back to back. 2. McGary – This is the first game where McGary’s name will likely appear on someone’s scouting report. He’s the great unknown in regards to playing against the Thunder. If he’s on the floor with Durant and Westbrook, it opens up another fold to the Thunder’s offensive scheme that opponent’s have rarely seen: a big man that can finish off the roll in the pick-n-roll. 3. Playoffs – The 8th seed is in play. The Thunder, Suns, and Pelicans all have 25 losses as of Wednesday, with the Suns having played one more game than the other two teams after tonight. It will be a fight to the end of the season. The Thunder have battled all this way. Let’s head into the All-Star break with some momentum, down only 1/2 game from the 8th spot.